Alemanes, 27, 41004 Sevilla, Spanien. EME Fusion hotel ia a renewed concept of cosmopolitan hotels, where luxuriousness becomes accessible. The diversity, the culture and the avant-garde naturally converge into a unique space of enjoyment, leisure and relaxation and where stays are converted into unequalled experiences. 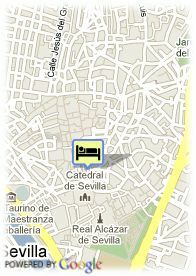 This hotel is located in the monumental, financial and trade heart of the city, within steps of the Giralda. Eme hotel offers a renewed view of the city of the Guadalquivir. Escape and rest, wellbeing and recreation, experience and taste for the unpararalleled care and service. One gets personally spoiled with the constant sensation of comfort along with the utmost feeling of privacy. Bezahltes überdachter Parkplätze beim Hotel (30.00 €).